Mr Tim Healy, Head of Food Ingredients Dairygold Ireland addressing Enterprise Ireland companies at the Lean Site visit to Dairygold. 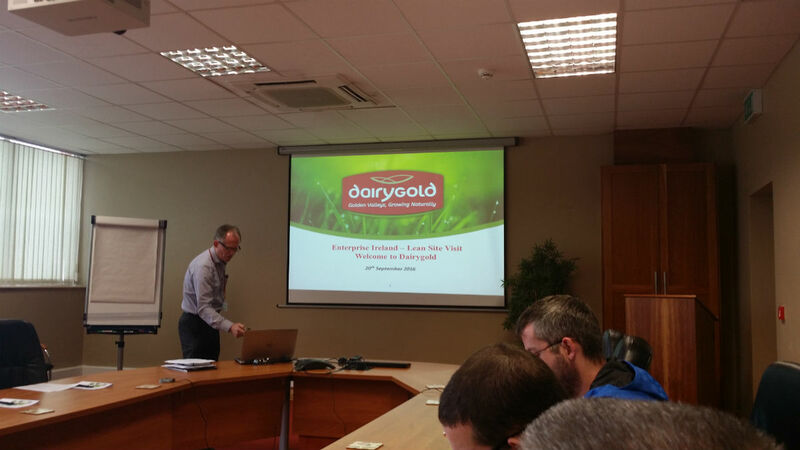 Mann Engineering got the opportunity along with a number of other Enterprise Ireland companies to visit the Dairygold Cheese making plant in Mitchelstown earlier this week. Dairygold’s Advance 20/20 program (“Making tomorrow better than today”) is one of the most advanced Lean Manufacturing programs in Europe and we got to see first hand how they go about implementing Lean principles throughout their business. Lean manufacturing and principles have been and continue to be an ongoing work in progress, which they have been at for a number of years. Theirs has been a long journey but a very impressive one. Continuous Improvement (CI) is a constant conversation throughout the plant and everyone on the tour was extremely impressed with the Dairygold operation. Dairygold have even started to engage with some of the farmers who supply them with milk in attempting to roll out 5S principles in farm operations was something you would not expect, but yet this is an area that they are starting to look at. Lean fundamentals are at the heart of everything that they do. Dairygold take in over 80 tanker loads of milk per day from their suppliers and produce 50 tonnes of cheese per day. Maintenance of the plant is critical as a breakdown of the plant can lead to unusable product. Not only are they making cheese, but the waste product of what they manufacture is whey, which is then used to manufacture whey protein. Dairygold have a sister facility nearby that is the largest producer of whey protein in the world. Special thanks to the Dairygold staff for their hospitality on the day, especially Sinead who gave us an excellent guided tour of the facility and also the the rest of the Dairygold team, Tim, Eugene, Niall and Tony.